Kuala Lumpur is a city that offers many splendors of Malaysian culture and history to locals and tourists. It is one place that often many locals take for granted as the best possible way to know the city is to explore the city by foot. 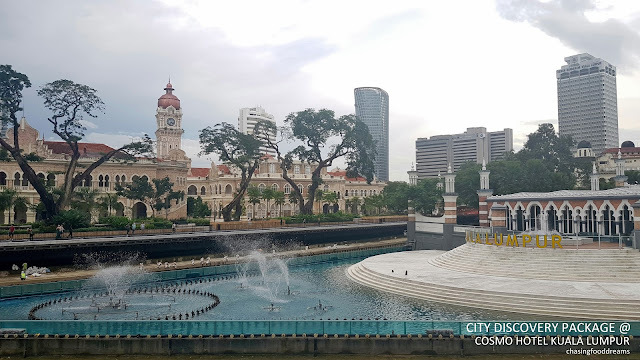 A recent staycation at Cosmo Hotel Kuala Lumpur had me, someone who has been living in the metropolitan city for the last 20 years, getting to really know and love the city even more. 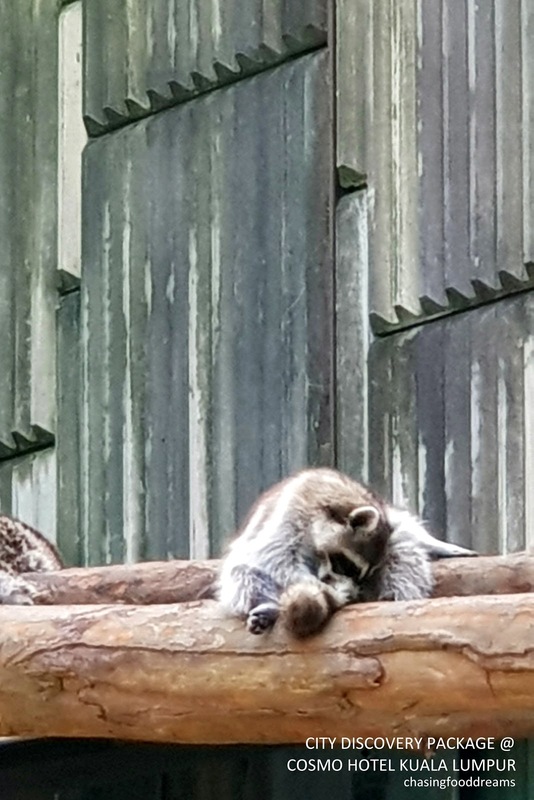 Despite the concrete jungle of skyscrapers and the heavy traffic, the city really had so much more to offer. 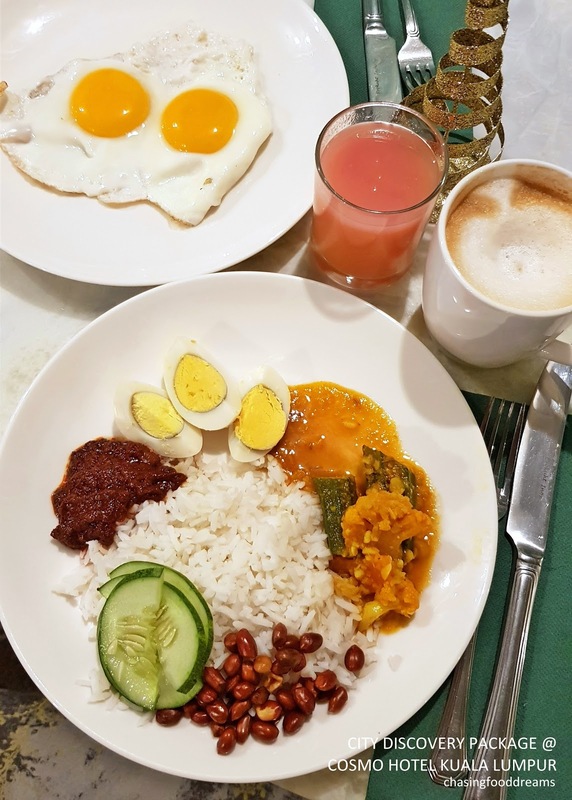 We checked in early at Cosmo Hotel Kuala Lumpur with a few friends, me and my little one that is. An early trip on a public holiday where the streets of the city are as fairly deserted. The weather was mighty fine. The rays of the sun was welcoming and the heat of the city was surprisingly bearable. It was an enticing City Discovery package from Cosmo Hotel Kuala Lumpur that prompted this plan on this quiet day in hanging out with friends and exploring what the locals termed as Cuti Cuti Malaysia! Priced at RM288 nett per room night inclusive of breakfast, set lunch and dinner for two persons; plus a flexible check-in time and a full 28-hour stay with complimentary access to the Hotel’s gymnasium and in-room WiFi access, it was hard to not take up this offer and let the little one learn a few things about KL. We left our bags at the hotel, chatting in relaxation as a we had a plan in place to visit KL Forest Eco Park. To be honest, I have passed the street of Raja Chulan countless times and yet, I have never notice this eco forest. A quick and easy 10-minute stroll with a few short stops for photos had us stopping a few minutes to appreciate the beauty of Mother Nature that day. 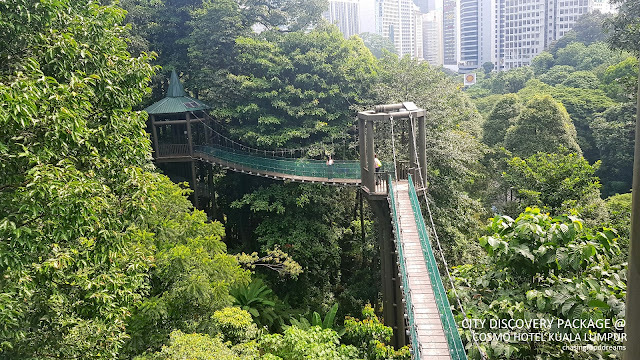 KL Forest Eco is free admission but always do check with the hotel concierge while one is there just to be sure. It is one of the oldest parks in the city and many of the locals seemed to remember their childhood memories of visiting this place. A quick search and its was reported that this eco park was originally gazette as a forest reserve all the way back in 1906. Located in the hills of Bukit Nanas, the forest reserve has two entrances. Whichever way one starts, one will end up leaving the other entrance in pleasure of Mother Nature local beauty. The fact that this forest reserve is well-kept right smack in the middle of the concrete jungle is pretty remarkable. 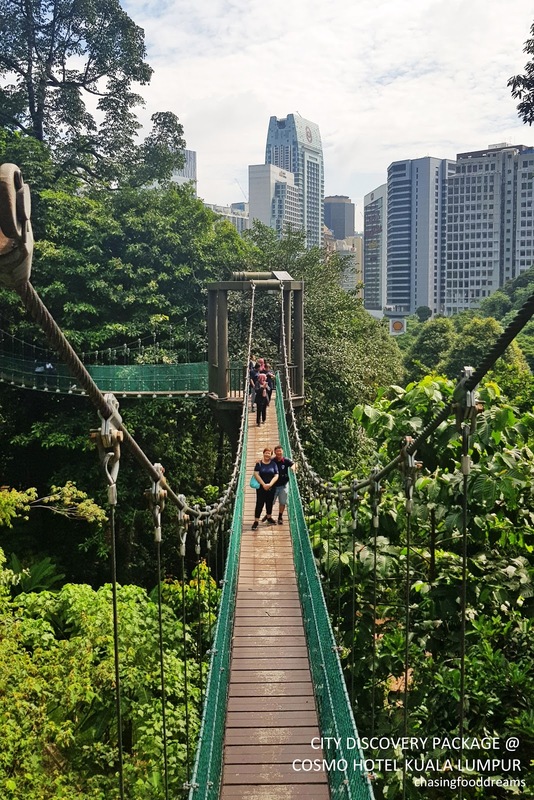 And what makes this must-visit trip extra pleasurable is the fact that the forest has a rain forest canopy walk, a few wild animals living in the forest and a gorgeous view of KL Tower. After the KL Forest Eco Park, it was almost lunchtime and we decided to head back to the hotel to check into our room and to grab some bites. Along the way back, we couldn’t help but to admire the streets of Lebuh Ampang. 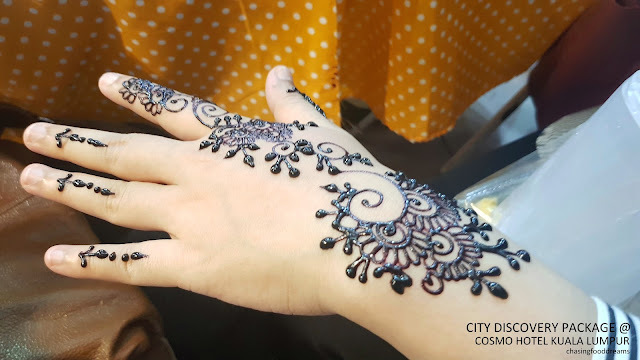 A cluster of Indian shops intermixing with some Chinese and Malay shops added much charm as a reminder of our beautiful melting pot of cultures living together. 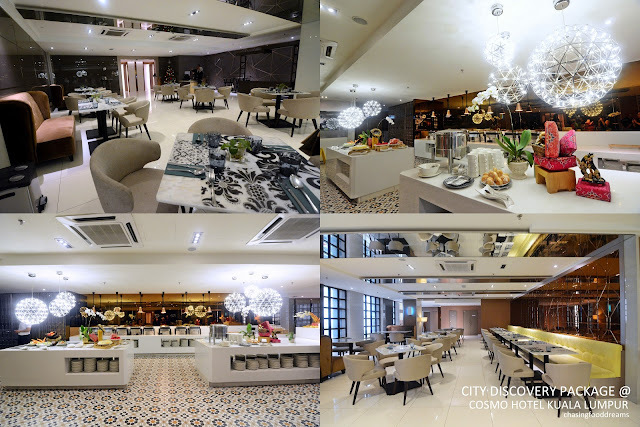 Despite the relatively standard looking building from the outside, Cosmo Hotel Kuala Lumpur is designed beautifully with various levels leading towards the lobby of the hotel. A quick check-in our room to freshen up and we headed to Café Mint for our lunch. 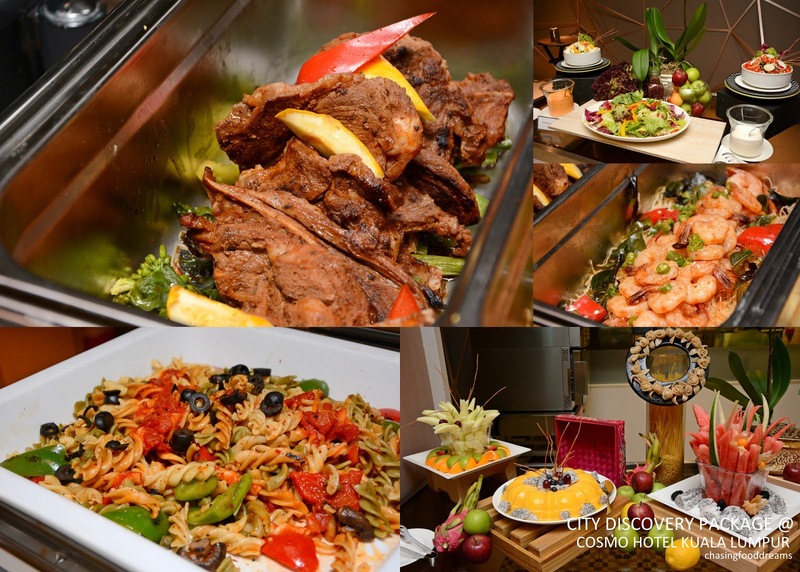 Part of the City Discovery Package which includes breakfast, set lunch and dinner for two persons, our set lunch was generously portioned. Choices may differ, but the classic Western set lunch is very enjoyable from Fish & Chips to Fried Chicken Chop and Minute Steak. A light array of salad, soup and desserts are included in the set lunch as well. Café Mint is the hotel’s all-day dining restaurant and is spaciously designed with neutral theme for an easy vibe. The buffet counters are well lite with globes of twinkling lights and brighten up with orchids and local colourful elements. The dining area is well sectioned, offering various spots of dining to choose from. We head back to our room to rest after that lovely lunch. My room was comfortable and easy on the eye. Nicely spaced, the bed was set in the middle and flanked by the usual bedside tables with lamps. One gets the usual amenities such as the LED television, work desk, cabinet with mini safe box, iron and ironing board, mini fridge with complimentary water, coffee and tea and free in-room wifi. The bathroom was set next to the bed with a frosted glass door. There is the rain shower and usual shower head bath that is sectioned through another glass panel with the usual bathroom amenities. 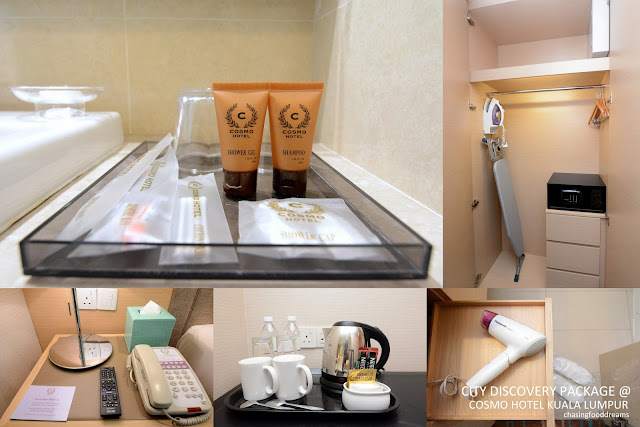 Cosmo Hotel Kuala Lumpur has 347 rooms and offers various types of rooms such as Deluxe, Executive, Junior and Studio Suites to cater to one’s need. The location is strategic as it is situated at the bustling area of Leboh Ampang. 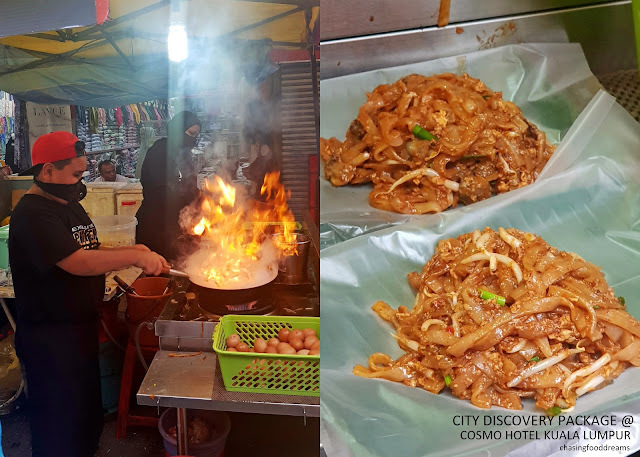 There are many popular attractions such as Central Market, the historical landmark of Sultan Abdul Samad Building and Merdeka Square, Chinatown closed by within walking distance. 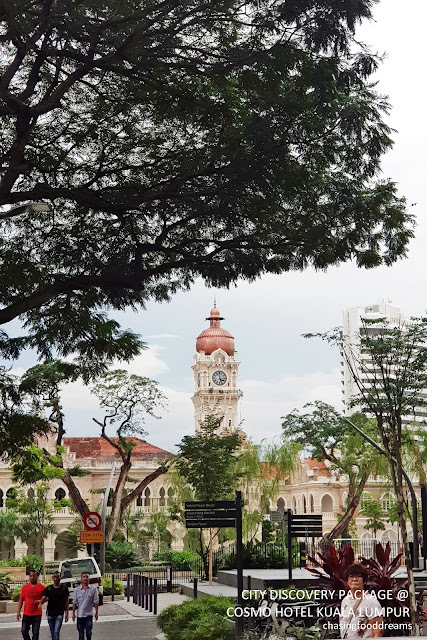 Public transportation is also a few minutes away, making it for exploration as well as travels from the airport via KLIA Express through KL Sentral. The hotel has a gymnasium, five meeting rooms, a boardroom and a lobby lounge along with the all-day dining Café Mint. Do check out their website for special promotions on their rooms. Cosmo Hotel Kuala Lumpur offers guests a special personal 3-hour guided Cultural Walking Tour priced at RM250 nett per person. 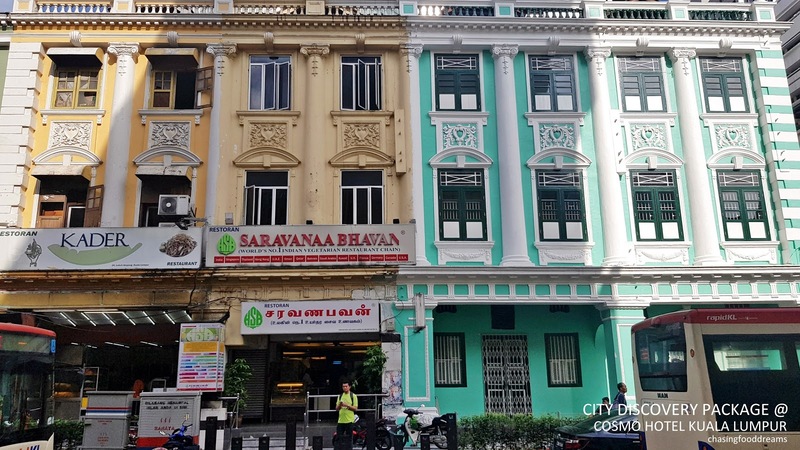 Reservations are required and one will be able to learn more about the city’s historical and cultural sites along with a taste of local cuisines. Our guide that day, Jane Rai was very knowledgeable and informative. From her stories of yesteryears of the city streets, iconic and historical buildings, famous landmarks to The River of Life project, we were certainly captivated with her tales. 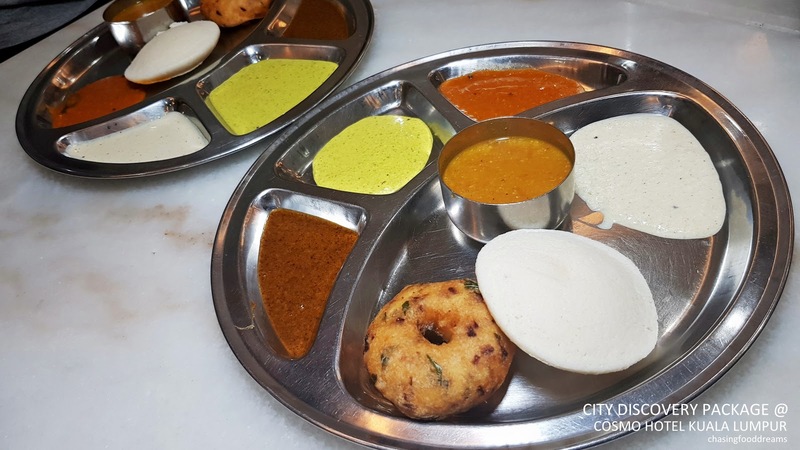 We made a quick stop at Jai Hind Restaurant, a Punjabi restaurant known for their signature chapati and curries as well as piping hot and spiced up Masala Tea. Next to Jai Hind, an Indian sweet shop that is set with a delectable list of Indian sweets guaranteed to lure the sweet monster out of every foodie. 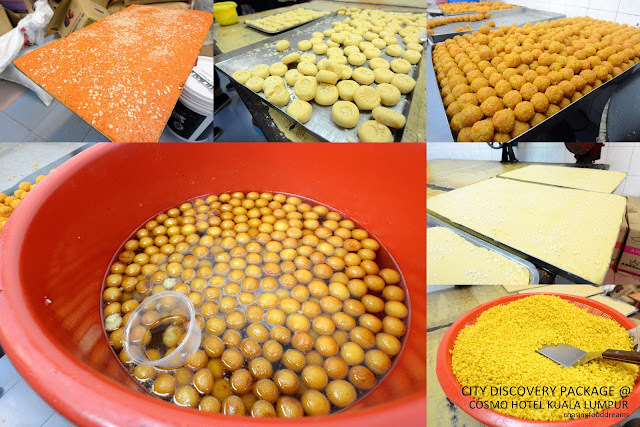 From Gulab Jamun to Almond Halwa, Jalebi, Barfi, Kesri, Ladoo and more, one can purchase these to try or simply get them from Jai Hind too. More street adventurous as we wandered through Masjid India and the night market where our nostrils and sight were lured into high frenzy of the array of scrumptious street food. Apam Balik, a non-stop production of hot crispy pancake filled with choices of peanut, sweet corn, chocolate and more seemed to be a crowd puller as the makers were smiling and chatting with the buyers happily. We did try one and boy-oh-boy, this was a really yummy Apam Balik! 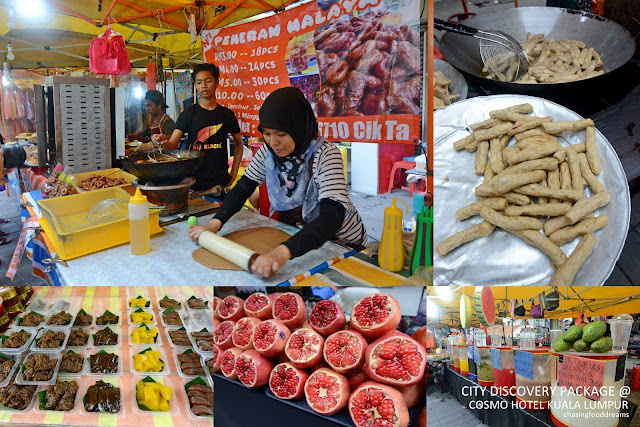 More goodies and every local kuih muih, Lekor, fruits, drinks and etc is worthy a taste… now only if we had more stomach space for these…. We stopped by one of the oldest cinema in the city – Pawagam Coliseum is still running today with mostly Indian films. Another quick pit stop to quench our thirst with Gunner A mocktail at the oldest bar in the city - Coliseum Restaurant and Bar! 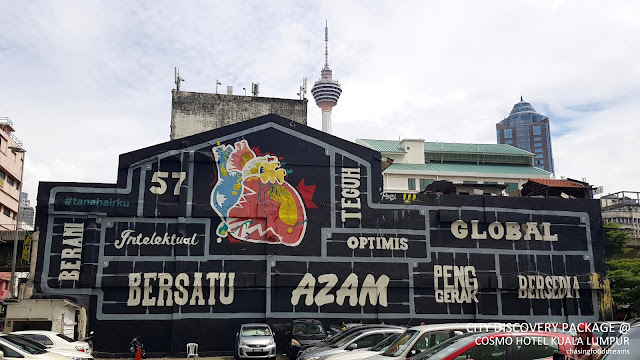 More maneuvering through streets where gold merchants are abundance in every corner, young and talented henna painters, textile merchants, songkok makers and barbers are just going on their daily rituals of selling their wares and services. 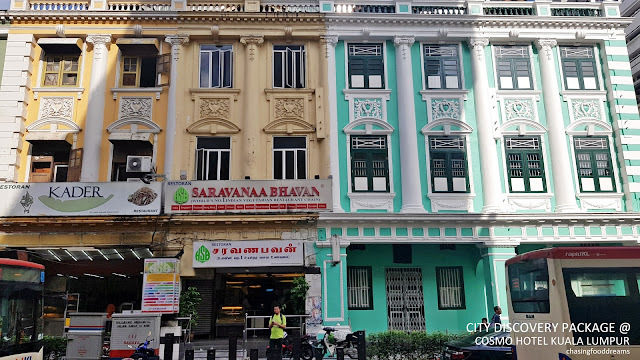 A last stop at Saravanaa Bhavan restaurant where luscious Vadai and Idly along with Thosai are vegetarian delights not to be missed. These were so well-made, I vowed to return again for these soon. The tour ended and we made our way back to the hotel for the evening dinner at Café Mint. 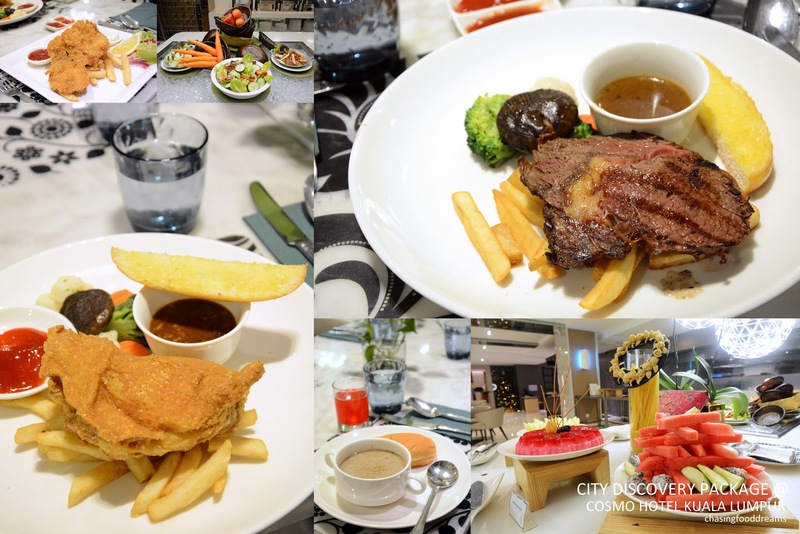 Barely able to tuck into our dinner from all the samplings earlier, we still enjoyed ourselves unwinding the evening with comfort and company. A good night rest and we woke up well-rest for breakfast before enjoying some leisure moments and then it was time to check-out. 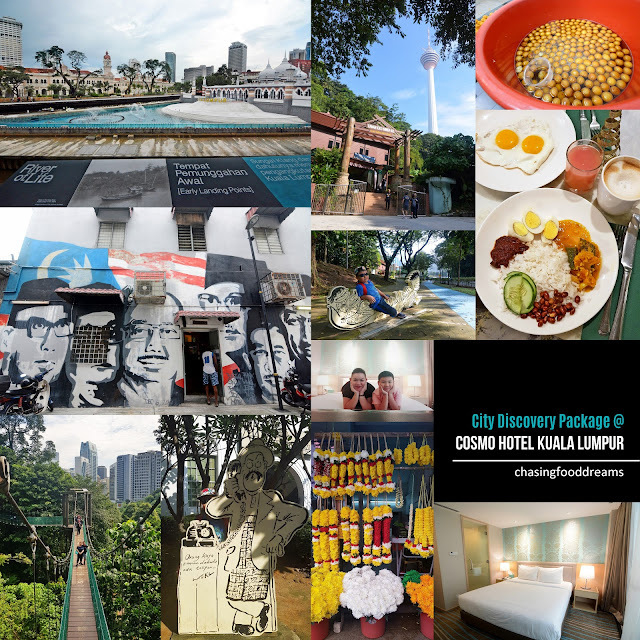 This is one promotion package for those who are seeking a short staycation in the city and perfect for those traveling for business or pleasure. I sure can use those nasi lemak now!